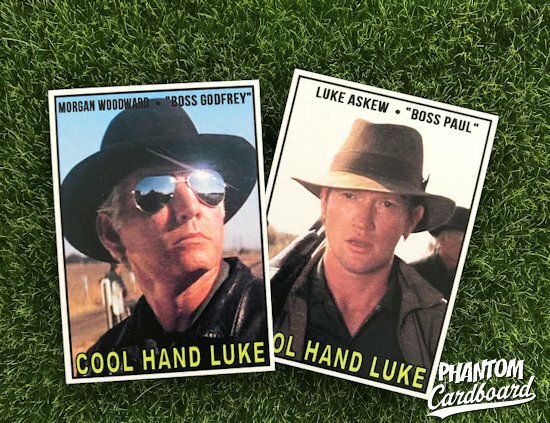 Cool Hand Luke is a little older than most of the things I focus on with my cards but it's an absolute classic and made for a fun custom card set project. 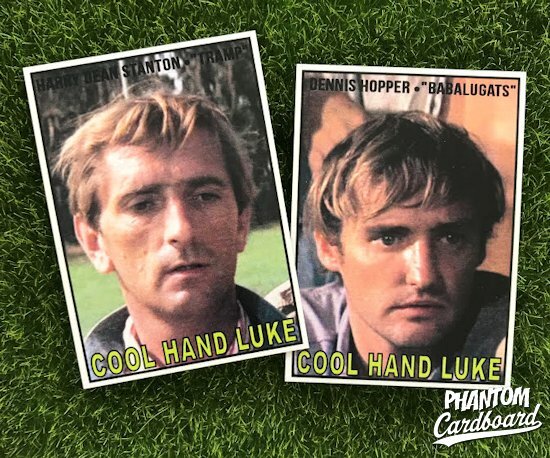 I remember the first time I saw Cool Hand Luke on TV. I was stopped in place as a preteen seeing Joy Harmon aka "Lucille" washing her car. It was the kind of experience where everything stops and you sort of disengage from your environment. What a body! The times I've watched it as an adult I've always sort like there is a deeper meaning to the Paul Newman's Luke character that I must be missing. To me he's sort of a nonconformist that has a problem with authority and just does things for a lack of something better to do. I've read some interpret symbolism from Luke as a Jesus type of character with the different hardships he endures throughout the movie. I guess I could see that, but mainly it's just timeless award winning performances ... and Joy Harmon tantalizingly rubbing her sudsy body on that 1941 DeSoto. 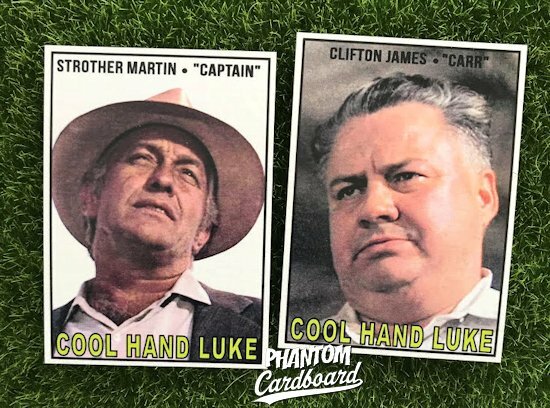 This set started out as a one-off with the "Lucille" card that became a personal treasure having been signed through the mail by Miss Harmon. Then I expanded it having turned my focus to making phantom mini-sets. This one got nine cards which is always something I like when it works out that way because they can display nicely in a nine-pocket card sheet. 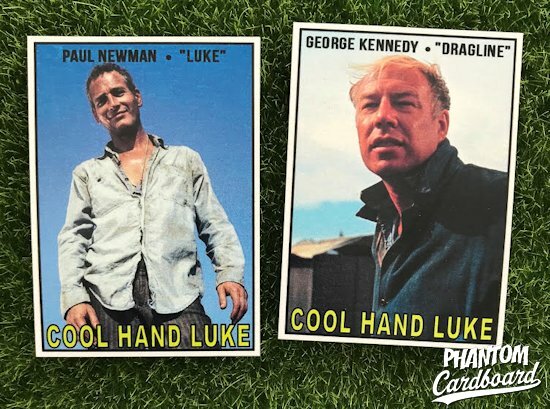 Cool hand Luke was released in 1967 so I went with a 1967 Topps baseball inspired template. Nothing too complicated but it really fits the cards and time period perfectly. Great idea for a set. The 1967 Topps baseball design isn't a favorite of mine but your choice of it still seems apt. Thank you. I try whenever possible to keep the cards year specific and since CHL was released in 1967 it gave me a chance to use this particular design. I had a great time backing up through your blog this morning, Jesse. Really love your imagineering and design skills. I've bookmarked and will be a regular fan. I'll certainly pick up some of your customs when I get to a month where I haven't (over)spent on my cardboard addictions. Cheers!